Located between Iraq and Saudi Arabia on the north-west corner of the Arabian Gulf lies the oil-rich country of Kuwait. It is best known in modern history for the Gulf War which broke out in August 1990 when Saddam Hussein’s Iraqi forces invaded and occupied the country. The war ended 7 months later when the Iraqis were expelled by a US-led coalition force. Whilst much of the city had to be rebuilt following the war it hasn’t managed to recreate the grandeur of former times. 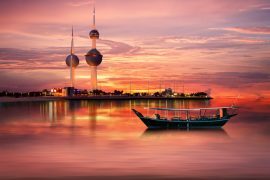 Unlike other countries such as the United Arab Emirates, Kuwait has refused to embrace commercialism and few tourists are seen wandering around the sights of the capital city. This approach is likely to change over the next decade as the tourism authorities attempt to replicate some of the success achieved by the likes of Dubai. 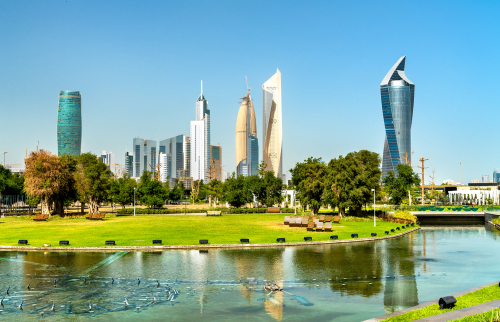 Kuwait City has a hot desert climate which sees daytime temperatures around 45°C in the summer months. 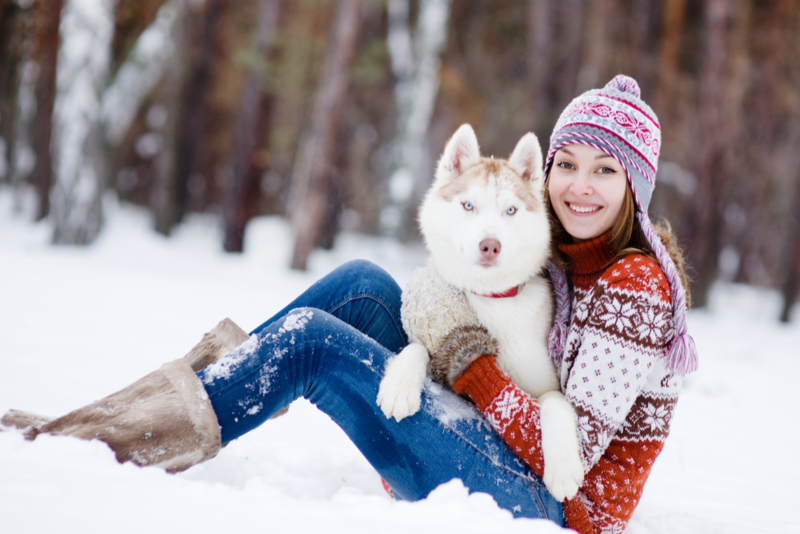 The best time to visit is in winter (December to February) when pleasant daytime temperatures below 20°C are typical. The month of February also coincides with the annual Hala Festival which sees the city host many musical and cultural events. Airport: International travellers will arrive at Kuwait International Airport which lies 15km south of Kuwait City. There are direct flights from London with British Airways and Kuwait Airways and from Amsterdam with KLM. The airport serves as a hub for both Kuwait Airways and Jazeera Airways who fly to many more worldwide destinations. 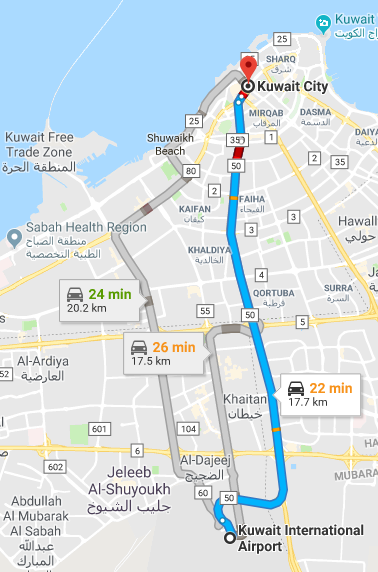 Transfers: For transport into the city there is a public bus (number 13) which drops off right outside the Sheraton Kuwait although this is hardly the most convenient option. Taxis are plentiful from outside the arrivals terminals otherwise you can pre-book a private transfer from Kuwait Airport with Shuttledirect. Getting Around: Whilst there’s an extensive public bus network it tends to only be used by local workers. Most visitors travel around the city by means of taxi though this can be something of a hair-raising experience. Ordering taxis from your hotel reception is usually a good idea. There is little focus on the tourism industry in Kuwait so most hotels are geared towards business travellers. A highly recommended 5-star option for business travellers is the JW Marriott Hotel Kuwait City (Al Shuhada Street) which is located in the city centre. Even more luxurious is the Jumeirah Messilah Beach Hotel and Spa (Al Ta’awn Street) which has its own private beach and numerous restaurants on the premises. A little less fancy is the iconic Sheraton Kuwait (Fahd Al-Salem Street) which was the city’s original luxury hotel. It offers an ideal location, excellent facilities and first-class service ensuring its continued popularity on the business circuit. In a similar price bracket but with more of a boutique style is the Marina Hotel (Salmiya, Arabian Gulf Street) which is right next to the sea. It is well equipped with swimming pools and restaurants and offers guests access to a private beach. 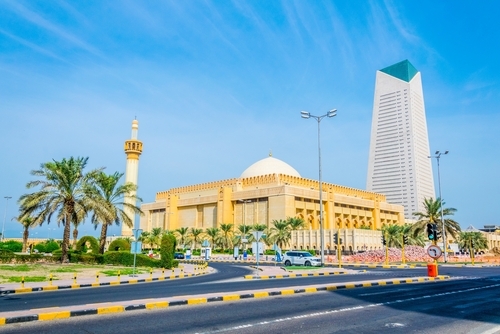 Grand Mosque: This is the largest of the many mosques in Kuwait which is big enough to hold 10,000 men in its main hall. There is a separate prayer hall for women and a courtyard where another 7,000 worshippers can pray. Visitors can take tours of the mosque in the company of guides who work there. Suitable attire is provided for females who wish to enter the building. Souq Mubarakiya: Dating back more than 200 years this traditional market was the centre of the city’s commercial life before oil became the mainstay of the national economy. It has been largely rebuilt since the Gulf War but retains much of its historic character. Visitors can leisurely stroll around its many stalls selling fruit, vegetables, fish and spices. Typical souvenirs worth looking out for include gold jewellery, perfumes and silk items. Be sure to haggle when buying anything from the vendors in the Old Souq. There are open-air restaurants around the market where you can enjoy typical national dishes and typical cafés where you can simply order tea or coffee and watch the locals going about their business. Al Shaheed Park: This large urban park located right in the heart of the city is an oasis of calm for residents and visitors alike. Complete with running tracks, botanical gardens, water fountains and a couple of museums it’s easy to spend a few hours here. In addition there are some nice air-conditioned cafés and restaurants where visitors can take a break from the searing afternoon heat. 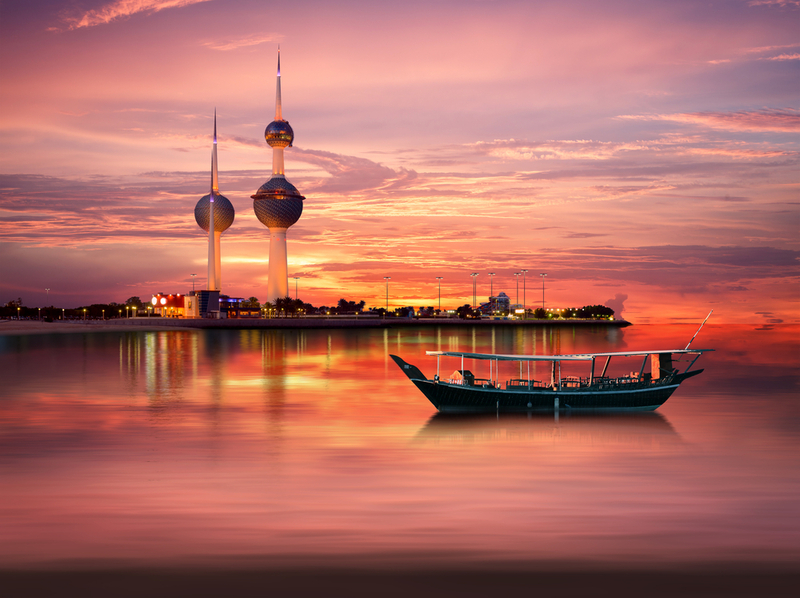 Kuwait Towers: These three narrow towers overlooking the Arabian Gulf are the most recognisable sight in all of Kuwait. Visitors can take a lift to a rotating observation deck which provides stunning views over the city and the gulf. Diners at the on-site restaurant are also treated to similar panoramic vistas. Dar Al Athar Al Islamiyya: This fine museum houses the al-Sabah Collection which is one of the world’s greatest Islamic art collections. The venue also serves as the main cultural centre in Kuwait City where frequent musical performances take place. Tareq Rajab Museum: Created by the country’s first Minister of State for Antiquities and his British wife this museum houses an impressive collection of Islamic art and calligraphy. Its gold section is particularly noteworthy together with its displays of ancient manuscripts and musical instruments from the region. Al Qurain Martyrs’ Museum: This poignant reminder of events from 1991 is a house in the suburb of Qurain where a small group of young men tried to avoid being arrested by the Iraquis. The building has been left in the same condition as after it was attacked. Scientific Centre: Located on the Salmiya peninsula to the north-east of the city centre, this family entertainment centre is a great place to visit with children. It is home to an aquarium, a discovery centre and an IMAX cinema together with a number of restaurants and cafés. Shopping Malls: In contrast to the Souk Al-Mubarakiya there are many modern shopping malls in Kuwait City where visitors will find many of the world’s most famous brands selling their latest wares. The most popular of these is the Avenues Mall which is the the 2nd largest shopping mall in the Middle East after the Dubai Mall. It is home to more than 800 shops and also serves as an important social and recreation centre where there are many restaurants, a cinema and great entertainment for children. In a Muslim country where alcohol is strictly forbidden the concept of ‘nightlife’ is quite different than it is in the Western world. There are no bars or nightclubs for visitors to frequent so shopping malls, restaurants and cafés become the centre of social activity. A few restaurants which are highly recommended include:Al Boom (Al Bida’a Road): Located in the grounds of the Radisson Blu Hotel this excellent steak and seafood restaurant is frequented by both Kuwaitis and visiting business people. The city’s hotel concierges like to recommend it is a unique dining venue as it is built inside a historic Kuwaiti dhow (traditional sailing vessel). Mais Alghanim (Arabian Gulf Road): Located near the Kuwait Towers this Lebanese restaurant is a large venue where excellent Middle Eastern cuisine is served by a team of very professional and courteous waiters. 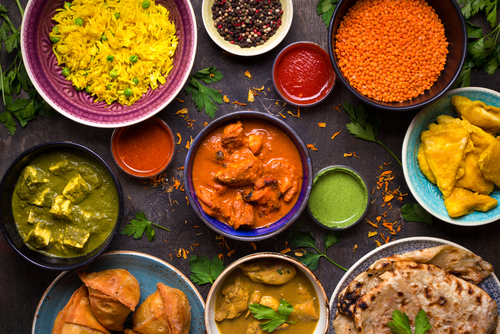 Jamawar Indian Restaurant (103 Street): Anyone visiting Kuwait City who enjoys Indian cuisine should make a point of visiting Jamawar which is located inside the Crowne Plaza Hotel. The food, service and ambience are all exceptional in what is arguably the best Indian restaurant in Kuwait.